When the 2003 season began with their prized free-agent acquisition of the summer injured for theiyear, the release of their defensive captain and a humbling 31-0 loss to division rival Buffalo Bills, no one believed a second championship was possible ... Except for the Patriots. Despite five opening-day starters on injured reserve, the 2003 Patriots not only battled back to respectability but all the way to champions of the greatest Super Bowl ever. Relive those final seconds as well as New England's astonishing season with this exclusive NFL Films footage. Years from now, the New England Patriots’ victory in Super Bowl XXXVIII may go down as part of a dynasty. It marked their second win in three years, so if they knock out another championship or two, they’ll go down as one of the NFL’s all-time greats. If not, at least we’ll remember the game for its halftime show. That presented Janet Jackson’s right hooter for all to admire, and it also introduced the phrase “wardrobe malfunction” into the vernacular. Unfortunately, except for one vague allusion in a supplemental feature, we find no coverage of that uncoverage in this DVD called New England Patriots: Super Bowl XXXVIII Champions. Actually, the main program doesn’t concentrate all that heavily on the game itself. The program quickly rushes through what happened to the Patriots after their win in Super Bowl XXXVI and then provides a general overview of their 2003 season, from game one through the playoffs. It takes a little more than half of the show to complete the regular season; we enter the playoffs after about 34 minutes, and each of those three games receives fairly full coverage. Of course, the Super Bowl gets the most attention, but the other two contests go under the microscope as well. The playoff material seems most interesting. The program runs through the regular season so rapidly that we don’t hear much more than very basic notes. After all, the program can only devote about two minutes per game, so the show needed to progress through them quickly. A few receive greater attention; for example, the tight contest with the Dolphins in week seven receives an extended glance. Otherwise, we get the basic highlights but little else. The presentation becomes more broadly delineated with the three playoff games. These gave us reasonably full details of the contests. The two pre-Super Bowl games filled a total of about 13 minutes, and the championship itself occupied the program’s final 13 minutes. Produced by NFL Films, Champions definitely isn’t the place to go for much more than a puffy, feel-good look at the Patriots’ season. Granted, the team did have a great year; they were the first squad to win 15 consecutive games since the 1972 Dolphins went 17-0. I don’t expect this sort of program to be a down-and-dirty examination of events, and I must admit it’s tough to find adversity in such a remarkable year. Nonetheless, some additional depth would have been appreciated. The show glossed over important factors. For example, Lawyer Milloy’s departure from the team came with no discussion of the reasons or about how this affected the team. In addition, we get occasional soundbites from players Tom Brady, Tedy Bruschi, and Rodney Harrison plus coach Bill Belichick. Not surprisingly, these tidbits seem fairly bland and uninformative. Most sports professionals are boring interview subjects at best, but when placed into a happy puff-piece like this, we can’t expect anything interesting. Overall, Super Bowl XXXVIII Champions seems aimed mainly at an audience of Patriots lovers. General NFL fans may enjoy the scrapbook look at that team’s season, but I can’t imagine many folks who aren’t Pats diehards will want to revisit the piece. It’s a puffy and fluffy look at their season, and its lack of depth makes it less than scintillating. 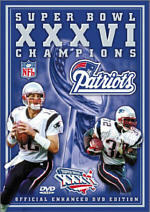 New England Patriots: Super Bowl XXXVIII Champions appears in an aspect ratio of 1.33:1 on this single-sided, double-layered DVD; due to those dimensions, the image has not been enhanced for 16X9 televisions. Overall, the picture seemed decent but contained enough flaws to drop my grade to a “B-“. Sharpness generally appeared adequate. Most of the footage came across as reasonably crisp and distinct, but more than a few shots displayed less than ideal definition. Some vague softness interfered with the presentation at times. I never saw anything that looked terribly fuzzy, but some examples were mildly unfocused. Jagged edges and moiré effects caused no concerns, and I also saw no signs of edge enhancement. In regard to print flaws, I detected some grain, but for the most part, the image remained clean. Colors looked fairly vivid and vibrant, though they also seemed somewhat lackluster. While well saturated and clear, I felt the hues could have appeared brighter much of the time. They displayed no decided problems, but they simply lacked the liveliness I expected. Black levels seemed dense and deep, while shadow detail – a minor issue during the brightly lit games – appeared appropriately defined without too much thickness. Ultimately, Champions suffered from few real problems, but the presentation simply seemed a little flat and lackluster. The Dolby Surround 2.0 soundtrack of Super Bowl XXXVIII Champions mainly suffered from a lack of ambition. The soundfield appeared very restricted for the most part. Frankly, the majority of the audio seemed monaural. Music opened up the spectrum fairly well, as the side speakers displayed the score with good stereo imaging. In addition, some crowd elements during games broadened the environment to a minor but useful degree. Surround usage appeared totally limited to general reinforcement of music and cheering; the rear speakers played a very small role in the presentation. Audio quality was good but unexceptional. Speech seemed natural and distinct, with no concerns related to intelligibility or edginess, at least not in regard to the narration. A few lines of play-by-play demonstrated mild distortion, but that only occurred a couple of times. The smattering of effects sounded clear and accurate, as the various hits and crunches appeared realistic. Music functioned best of all, as the score and songs presented bright highs and pretty solid bass response; the mix enjoyed good low-end punch from the music. Overall, this remained a fairly bland soundtrack, but it displayed no substantial concerns. As we move to the supplements, we start with a program called EA Sports NFL Matchup. This 20-minute and 52-second piece gives us a recap of the Super Bowl. It presents a discussion from hosts Sal Paolantonio, Merril Hoge and Ron Jaworski as they dissect various elements of the game. They pick through various elements of the contest and highlight small elements that the average viewer wouldn’t notice or understand. The sponsor comes through via the occasional nonsensical demonstration of plays via Madden 2004 simulation, but this nonetheless provides a pretty good examination of parts of the game. For a very cool addition, we head to the World Broadcast. I thought this would present some foreign language play-by-play, but it doesn’t. Instead, the 70-minute and five-second show offers the game in its entirety. Minus commercials and most delays, we just get the action with English play-by-play. It feels weird to see a football game fly by at such a pace, but it’s a lot of fun nonetheless. I never quite realized how much tension the many pauses add to the game, though; this presentation is satisfying for a recap, but it doesn’t leave room for the kind of interpretation and analysis we’d like to do during a live broadcast. Anyway, I really like this extra and think it contributes a lot of value to this DVD. More of this sort of material shows up in Post-Game Sounds. The eight-minute and 25-second collection gathers after-Bowl remarks from Belichick, team owner Robert Kraft, and Patriots Harrison, Deion Branch, Troy Brown, Bobby Hamilton, McGinest, Smith, Brady, Tedy Bruschi, It’s more of the same, with additional generic comments from the participants. Don’t expect anything interesting here. Lastly, Quick Hits runs 185 seconds. This quick program gives us a little look at the viewpoint of the international journalists who covered the game. At least that’s the goal, but it all flies by so quickly and superficially that we don’t get a real feel for their perspective. It’s a fluffy and fairly pointless program. 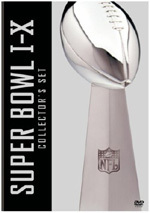 For fans of the New England Patriots, Super Bowl XXXVIII Champions offers a nice souvenir of their second big season in the last three. For others, however, the show seems too light and fluffy to provide much value. 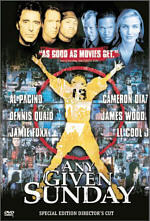 The DVD provides bland but acceptable picture and sound along with an erratic set of extras highlighted by the inclusion of the complete Super Bowl. Diehard backers of the Patriots will want to give it a look, but others probably won’t find much in it to interest them.